Picture the scene. 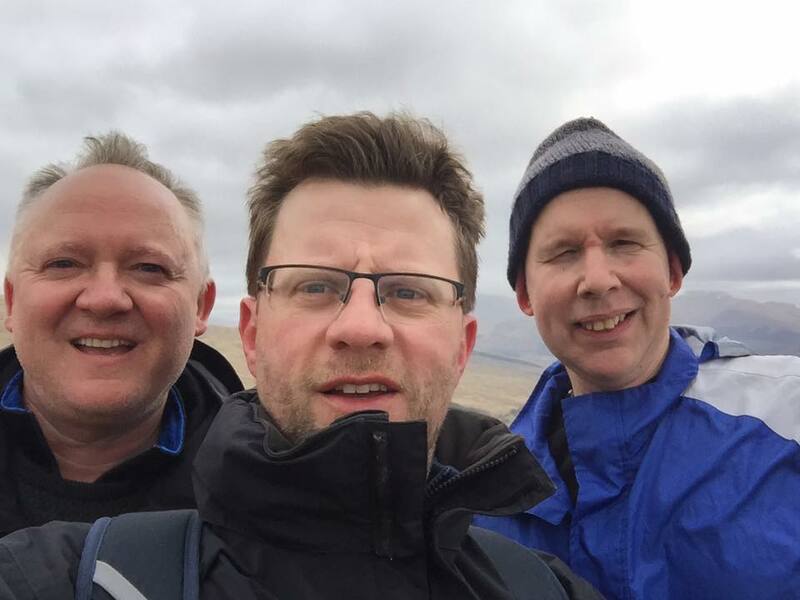 Three innocent chaps up from the big city, gazing out hopefully from a remote bank on Loch Lomond. They are scanning the steely grey surface for signs of an approaching ferry from the opposite shore. Those three guileless blokes were me, Ben and Bryn. We looked again at the map. ‘Ferry P (summer)’ declared the text below the dotted line from an unmarked, unpopulated spot on the eastern shore (our location) to Ardlui (our aspired destination). This was a cool day streaked with rain in early April. A poor ‘Summer’ offering by anyone’s definition. We had initially been reassured by Ben’s research that morning, over a fine Scottish breakfast, that suggested The Ardlui Hotel – the ferry operators – believed Summer in these parts began on 1st April. And that the afternoon service ran from 3.30pm. 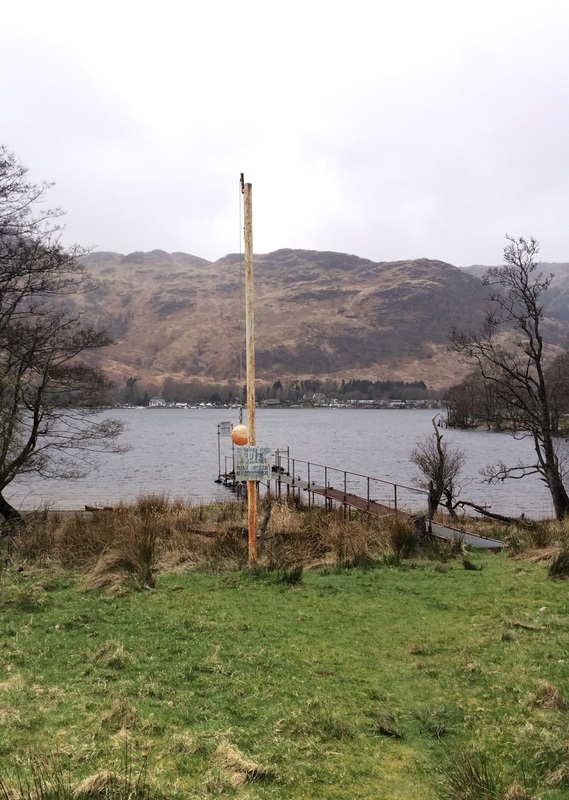 Stood there by the rickety landing stage in the middle of nowhere and with only an inflatable bollard on a flagpole to communicate with the far bank, it was easy for doubts to creep in. Nevertheless, optimistic types that we are, the chipped orange bollard – it would remind you of something that had fallen off the hull of a fishing smack in about 1972 - was raised up the flag pole by means of a frayed length of sail twine and tied off in my best double-hitch. And we waited with an air of mirthful scepticism. And yet after 6 minutes – Bryn had timed the wait – we spotted a small white launch sliding through the water towards us. I swear my heart jumped a little at the prospect. I lowered the bollard (only after being certain that the boat was really heading towards us and not just out for a pleasure trip around the headwaters) and we climbed aboard with big grins. We had caught the ferry by the slender margin of 6 days and one hour. Simple pleasures. More simple pleasures were on offer in the bar of the Ardlui Hotel, overlooking the calm waters and sun-dappled hills. 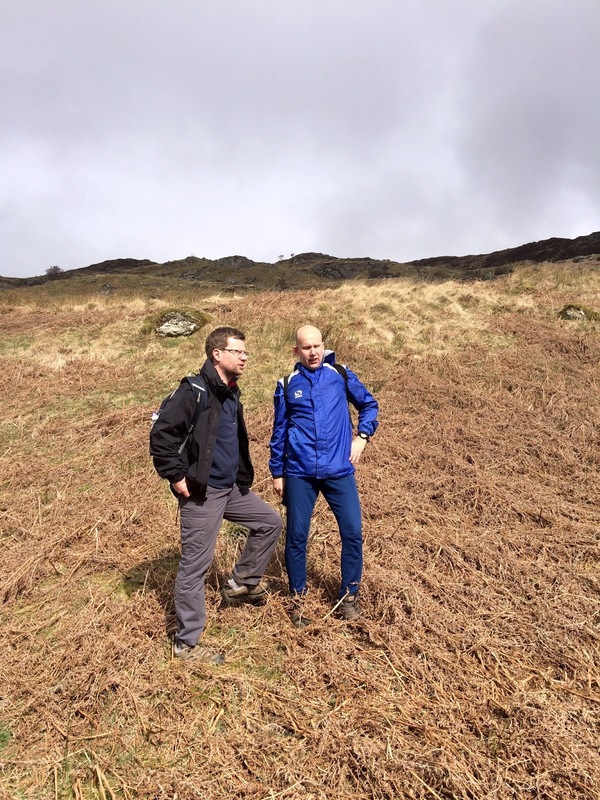 We deserved a couple of beers on completion of our outward expedition from Crianlarich. The walk had initially followed the western side of Glen Falloch on the old military road on the downslopes of Breadalbane, where we ploughed and slopped through enough Highland cattle crap to fuel a small methane power plant. Later, we ran in to a small herd of tough looking goats. They were sprawled over the path and were tucking into grass as wiry and unappealing as themselves. We got eye-balled a couple of times and they seemed unperturbed by our presence, necessitating a wide berth around them. I noticed that Bryn and Ben had were happy to let me take the lead. 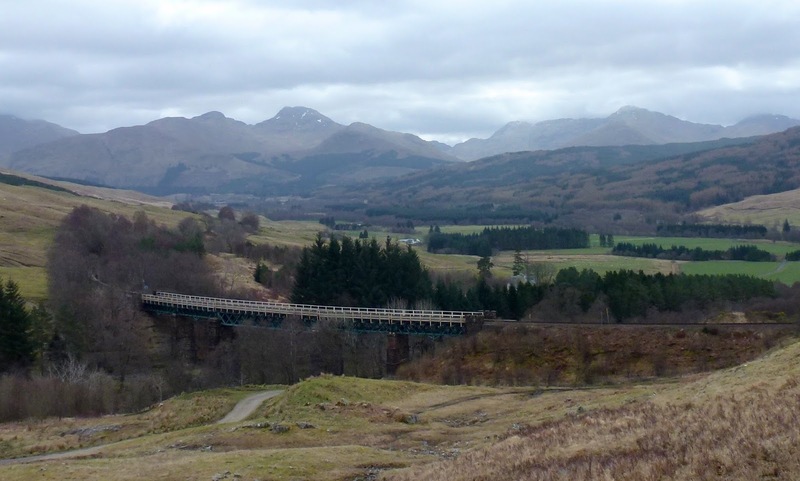 The valley had broadened out and we crossed over the West Highland Railway and then the River Falloch to follow the eastern side of the glen towards Loch Lomond. The landscape around us changed from epic screes to undulating upland with more vegetation. The river gurgled by our left hand side overhung with bare birchwoods coated in moss and lichens. Gorse was just about coming into flower. These had been the best views of the day. 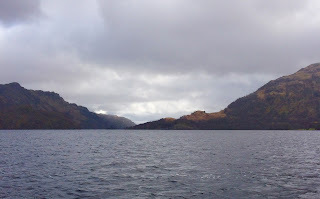 We had ascended and then rounded Cnap Mor to be rewarded with a dramatic reveal of the loch. The aspect had summed up our trip in one sweeping image. Bright sunshine picking out ridges in the rock and ripples on the water, either side of a backlit rain shower blowing in from the north west falling from a big sky of blanket cloud vented by light blue and blinding white. Back in the pub, we were contemplating our next move. Walking home seemed like an effort too far after the day’s leisurely, but sufficiently taxing 10 mile hike. 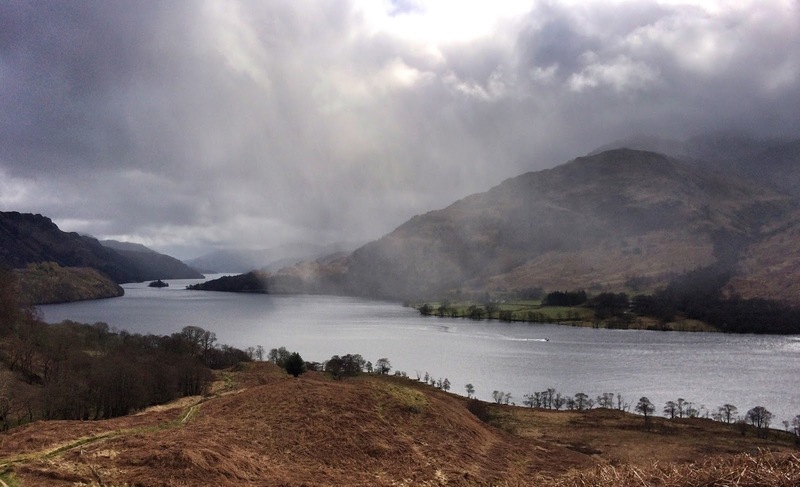 The rail link up to Crianlarich was broken because of a landslip outside Glasgow two days before. There followed some web-based double-checking, firstly to make sure our return sleeper service was running that night and secondly to find the time of the rail replacement bus service. Internet connections were mostly OK on this trip, despite the well-publicised problems in rural UK. I managed to send in my Fantasy Cricket team to Danny in Whitehall two hours before the deadline, despite an intermittent signal, an un-navigable database and a phone with a smashed screen. My first attempt only had ten players. Apart from that small glitch, I thought I did pretty well. Later, Ben paid his child minder via electronic banking from a bleak spot five miles from civilisation in the lee of Derrydorach’s sheepfold. We have the technology. Stood in the lay-by outside Ardlui station – no more than a raised platform with a small shelter and a bike rack – it occurred to us that if the train service had resumed, we would have no way of knowing. The station had a total absence of any current train service information, either electronic or personal. And there was no wifi out here. So Ben posted himself at the entrance ready to leap up the stairs and hold up any train that should decide to arrive on the up-line. Then a bus lumbered in to view. The driver saw Ben and flashed lights at him in various combinations. The bus pulled up in the road at the front of the station. Not, of course, in the lay-by where there was a proper bus stop. We gathered at the door. It didn’t open. Ben could see the driver gesticulating and flapping in animated fashion. Eventually the door swung open and we were blasted by ‘Edelweiss’ from the PA at a goodly volume. He quickly turned it down and pointed to knobs, buttons and dials on his console. He managed to find the CD knob again though. Soon we were swinging through the glen on a crooning wave of ‘The Old Rugged Cross’ and other popular classics. We were the only passengers and he dropped us right outside the hotel. “Are you going all the way to Fort William?” I enquired. The Crianlarich Hotel had served us well. Arriving off the sleeper on Wednesday morning, we had abluted in the loos, stored our kit in the drying room and scoffed mountainous breakfasts, replete with haggis, black pudding and potato scone. Deeply conscious of high running Indyref2 feelings I had blurted out ‘cooked breakfast’ for my order, narrowly avoiding a ‘Full English’ diplomatic incident. Of course, ‘Full Scottish’ would have been more accurate and I was better prepared the next morning. Bryn had been initially hesitant about piling in to the fry up. Whilst Ben and I were awoken early in our berths by a stirring strong black coffee, it became apparent that Bryn had already been up and pacing the corridors. By then he was back on his bunk and unmoving. The whisky sweats had descended. The previous evening had seen us celebrating the journey with a few beers in the buffet car. As we sped through the Midlands and lumbered through the industrial North-West we had gradually outstayed the other passengers. 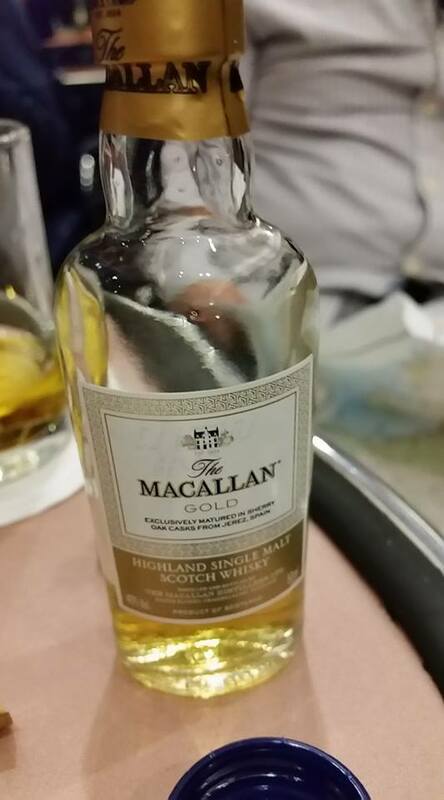 It was time for a nightcap and the extensive malt whisky menu was consulted. It had been tricky to make selections. Whether the Auchentoshan 12 year with its “nose of still-warm Christmas pudding”; the Balblair 2003 Vintage “with the enticing pull of apricots, butterscotch, honey and citrus luring you in for further inspection”; or the Bowmore 18 year’s “freshly split oranges, damp wood and a hint of warm, sticky lemon”. Who writes this stuff? However, it was the Old Pulteney 12 year, matured in old bourbon casks, that did for Bryn. The medium finish evoked fewer of the “memories of a coastal fire with hints of burning oak and spice” and more of the spinning-sleeper-compartment and thumping-frontal-lobe sensations. 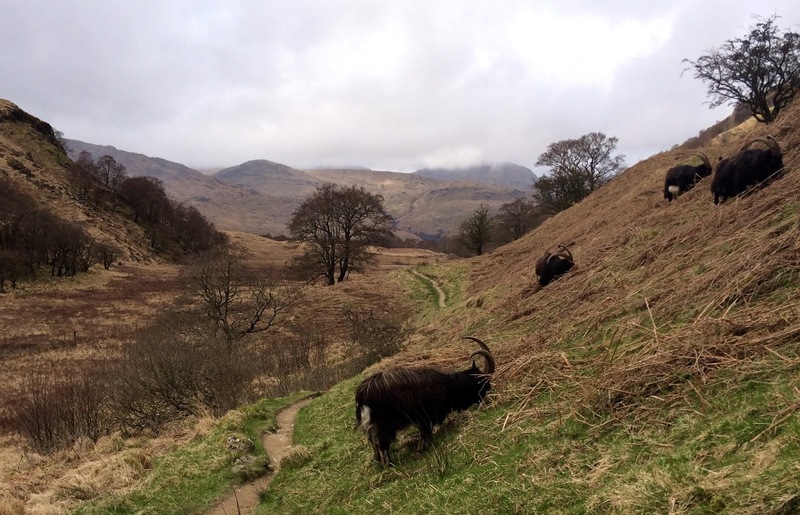 Nothing that the brekkie and walk up Strath Fillan didn’t easily sort out. Though the first map crisis of the day can’t have helped. We hadn’t even found the West Highland Way before we were looking at a roundabout that refused to be correlated with Explorer Sheet 364. In the end, we decided it was a new relief road around Crianlarich that the OS hadn’t yet caught up with. We ignored it and headed for the hills. The first part of the walk was through upland pine woods with glimpses north-east of the dominating hulk of Ben More, together with his brothers and sisters. The path was cut through with lively streams before we crossed over the more substantial River Fillan, past the ruined Kirkton Priory and then on to a coffee-and-cake pit stop at the Auchtertyre campsite. All the while, at least it seemed that way, Ben had been relating the grisly details of his recent vasectomy. At first I thought our hero of the snip was using Bryn and I as a kind of therapeutic intervention. Unloading his pain – of which there was quite a lot – in order to staunch the flow (as it were) and move on. Certainly, graphic analysis of the procedure – pubic shaving, elastic bands, distracting holiday conversation, tube incisions, burning cauterisation and subsequent bruising - had a cathartic quality about it. But the level of interest shown by Bryn went beyond casual interest or sympathetic understanding. Whilst Ben had introduced the subject over those single malts on the train the previous evening, by the next afternoon it was Bryn who was again keen to pick over the minutiae. He’s next I reckon. We had chosen a peak above Tyndrum as our off-piste climb. The hitherto nameless mound became known as hill 534 in respect of its metreage. It swiftly became known as many other, less-printable names too, as ridge upon successive, boggy ridge gave way to yet more false summits. The view from the top back down the valley, ultimately, was worth it. We took many top-of-the-hill pics, Ben re-arranged his sack and then we struck westerly to find sheltered spot in which to scoff our sarnies. Less fun was had getting down the hill into Tyndrum. Barbed wire seemed to be hemming in our descent at every turn. Trying to find a crossing point from a Forestry Commission plantation over the West Highland Line proved challenging. Eventually – and this time the map proved to be accurate – we found and made use of a disused iron footbridge. Like the goat herd the next day (and indeed the raising of the ferry bollard) I noticed the boys hanging back a little as we surveyed the decrepit construction before us. So I blundered onwards. The bridge was fine, though the rail tracks could clearly be seen between its creaking, moss-covered iron ribs under our feet. We had more wire to negotiate at the other side and one wonders why the bridge was still there. Lucky for us that it was. Tyndrum wouldn’t be the most picturesque stop off in the Highlands. But it just might be the smallest village with two railway stations. Neither of them could help us get back to Crianlarich, though. Trains seemed sporadic in the late afternoon and as we enjoyed a couple of pints in the Tyndrum Inn, I had thought I’d found bus to get us back. Off we toddled to the bus stop. And waited. And waited a bit more. There was no bus. The trip back home on the Sleeper was as efficient as on the way north. Although we had travelled in the Easter holidays, the trains were not too busy. On the journey out of Euston, the train manager had put the three of us in two adjacent cabins with the door wedged open. A sort of sleeper knock-through. Ben and Bryn had one set of berths and I shared the other with Bryn's giant red, wheeled-suitcase had the other. Ben’s little hard shell suitcase with plastic wheels wasn’t much better. I felt very smug with my pukka rucksack swinging from my shoulders as they rattled and clattered their suitcases through the quiet streets of Crianlarich at 7.45am. Tourists. Little did they know I’d had to let out the waist strap to the loosest possible setting just to get the thing round my expanding girth. On the way home, the train manager again sorted us out. We had taken the cheap-skate option and booked seats instead of cabins. We boarded the train and made our way through the buffet to the seated carriage. We looked at each other in some confusion and the train manager paused. “I’ll see if we can find you some berths”, she eventually said. And she did. She found us adjacent cabins, as on the journey two days earlier, but the connecting door was locked this time. 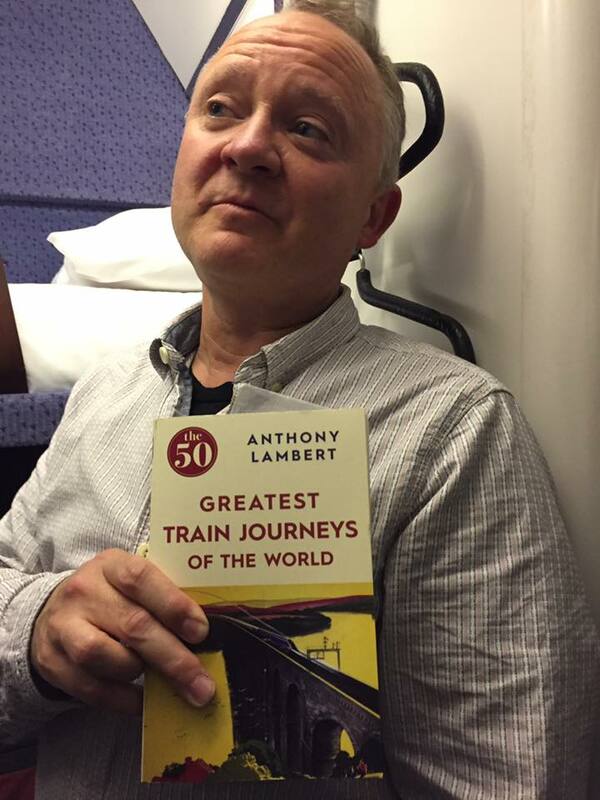 This deprived me of the chance to read excerpts to the boys from my book, ‘Greatest Train Journeys of the World”. 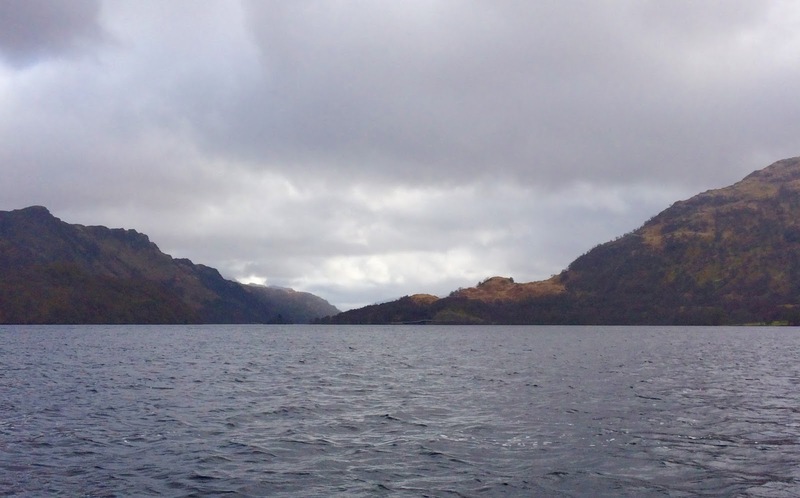 “The 100 mile West Highland Railway begins at Craigendoan Junction where the train turns abruptly north along a ledge with broadening views over Gare Loch. The diesel engines growl up the bank through leafy Helensburgh, while ships ride at anchor in the estuary, before disappearing behind loch-side woods. Same time next year, boys?